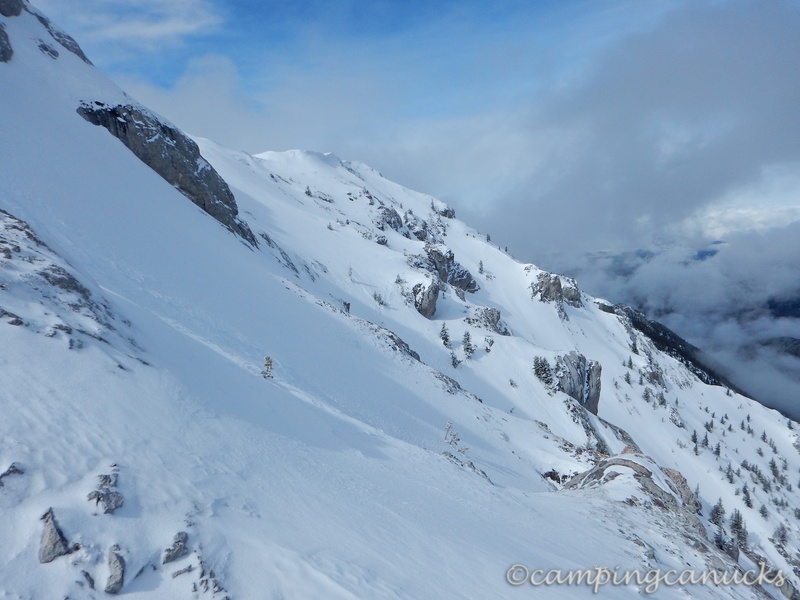 Towards the end of March 2015, I saddled up with Anthony for a trip to the top of Mount Bowman, just outside the boundary of Marble Range Provincial Park. 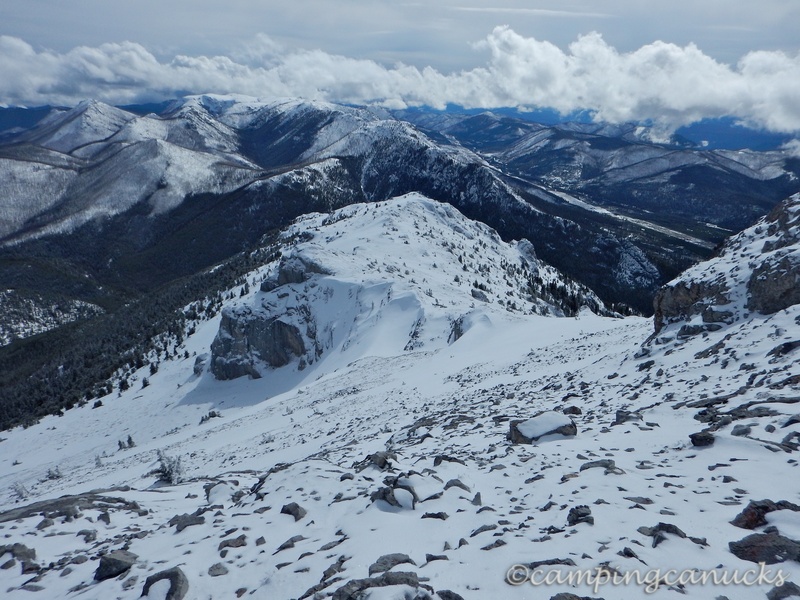 I had seen this peak from nearby Wild Horse Ridge during an overnight backpack trip as detailed in this post and knew I would be back to have a go at the top at some point. Although I had figured at the time we would be doing it when there was little or no snow. There are quite a few trail reports to be found on how to get to the top but I wasn’t able to find any information as to what it would be like doing it so early in the spring. So for that reason, we decided that we would be bringing along the snowshoes. With an elevation of just over 2200 meters, we expected there would be snow to be found both on the peak and on the trail on the way up. To see if anyone else was interested, we also posted it as a hike/snowshoe on the Kamloops Hiking Club events page in case anyone wanted to join. Unfortunately, Rob, who runs hikebc.net ended up not being able to make the trip, so it was just the two of us. 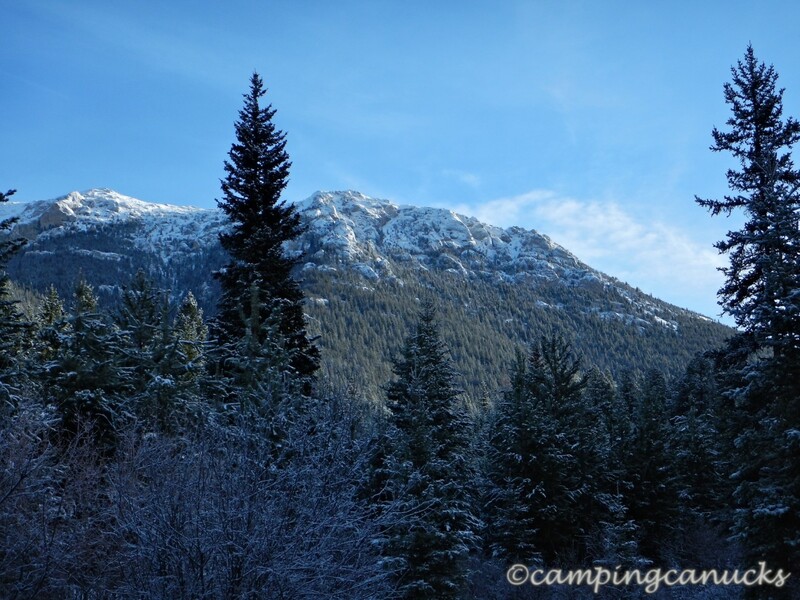 It’s about a two hour drive from Kamloops to the trail head that I had used once before, but with uncertain conditions and snow levels, we fully expected we would be parking along the way and walking to the start. We were correct, not because of snow, but because of downed trees across the road. Unfortunately I hadn’t brought my chainsaw along, so we ended up parking about a kilometer short. Being that it was only about a kilometer in a straight line to the trail start, we decided the fastest way was to go straight through the bush rather than follow the road in. I wouldn’t call that a mistake, but we did lose some time due to backtracking and negotiating around large amounts of deadfall. In retrospect, we should have just followed the road. In any case, once we got ourselves out of the brush, we got our first views of our destination being lit up by the morning sun. The trail follows along the southern side of the peak, between Mount Bowman and Mad Dog Peak and was largely free of snow for the first couple of kilometers. There were, however, quite a few downed trees across the trail that we had to go over or around. After about three kilometers, we reached the junction at a rough campsite that exists along the way. From here, you can go east to Wild Horse Ridge or north to Bowman. The trail that leads to Bowman ends up on a ridge to the east of the peak and seems to be the most popular approach, although I’ve read info that implies there are other ways up. The trail up follows the stream and there was quite a bit of snow to be found; we were soon were sinking up past our knees in the snow. 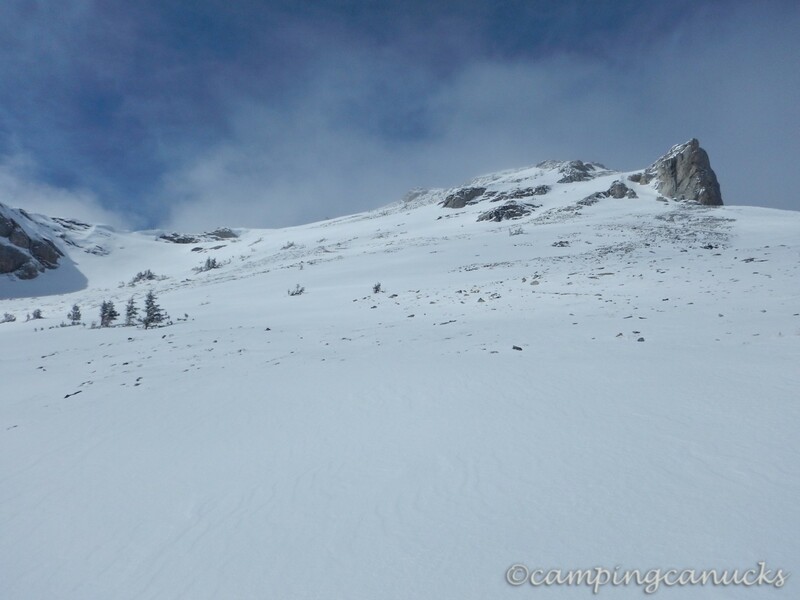 We stopped, strapped on our snowshoes and continued on our way up. It was slow going but eventually we reached the meadows near the head of the creek and we knew we were getting ready to ascend up onto the ridge. The problem, of course, in winter is that you cannot actually see the trail and as there were no markings on any trees, we ended up going off the trail and essentially climbing the wrong ridge. This lead us up into some pretty steep and very treed areas that was really hard going but we kept just heading towards the nearest cliffs we could see in the hope that we could somewhat easily make our way over to the next ridge. In the end, it was just too hard going, so we finally had to give in to descending into the gully between the ridges, in snow that was more than waist deep much of the time. Eventually we were on the correct ridge and could clearly see how much easier it could have been if we had known where the trail was. Such as it is. Making our way to the cut where we expected we would begin heading up the peak, we got a sudden scare by a flock of ptarmigan bursting out of the low lying bushes along the way in front of us. As I had my head down and just heard a loud noise, my first thought was ‘Avalanche!’. It scared the hell out of me but was good for a laugh once we realized it was merely a lot of birds. 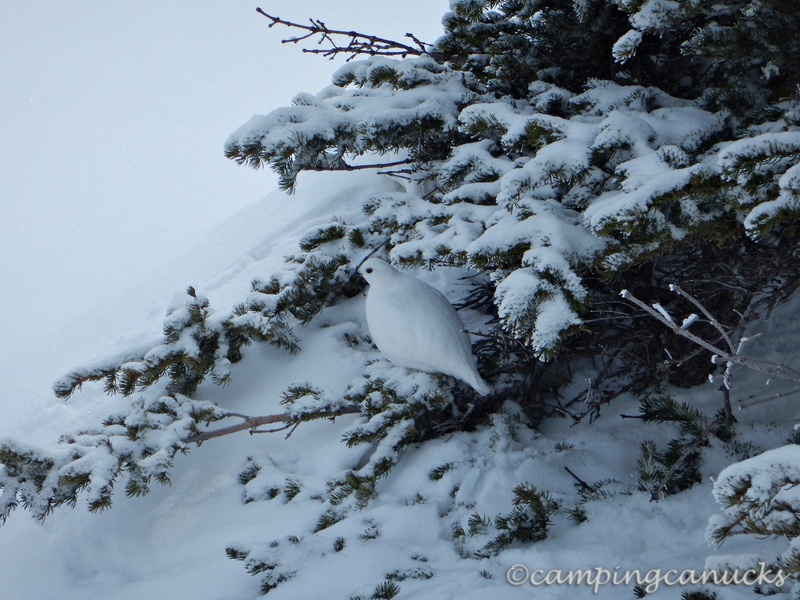 And it was kind of cool as I had never seen a white-tailed ptarmigan before. They were very well camouflaged. With the increasing wind due to the exposure now that we were getting above the treeline, we opted to stop for a bit of a break and throw our jackets on. This also gave us a chance to size up the situation and determine 1) Were we going to proceed?, and 2) How we were going to approach the next section? Since we didn’t know for sure about the potential for avalanches, we threw on our beacons just to play it safe. We had previously decided, though, that if it looked like a high avalanche risk, we would have aborted the trip at this point. We had seen what is the usual way up but from where we were stopped, we could see a second approach and just decided to go for it as it was closer. It was a steep climb that found us making our way up a narrow chute that was pretty heavily loaded with snow. The tough part at this point was that it was a matter of kicking our feet in, snowshoe and all, in order to make a step. We were also concerned about whether we were going to trigger a slide. 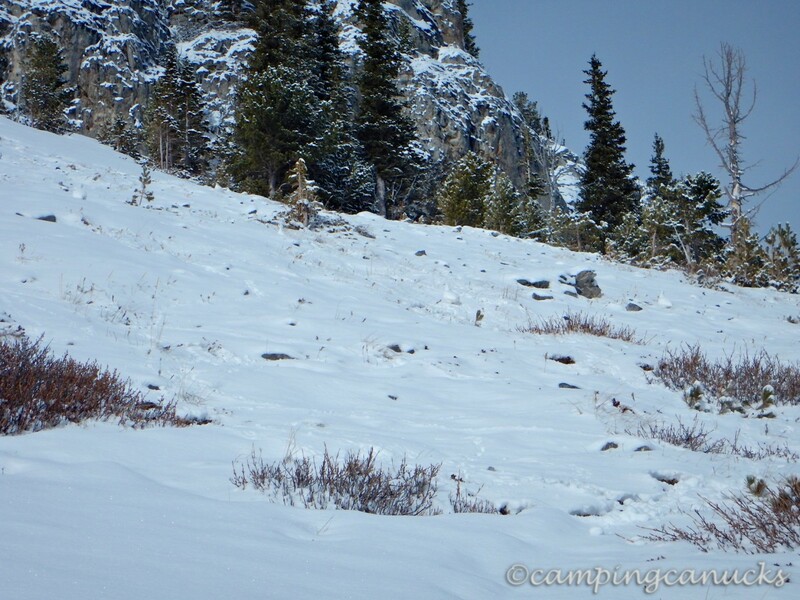 Some exploratory stomping seemed to show that the snow pack was very firm and didn’t seem like it was going move. Also there were no signs that any previous slides had come down. 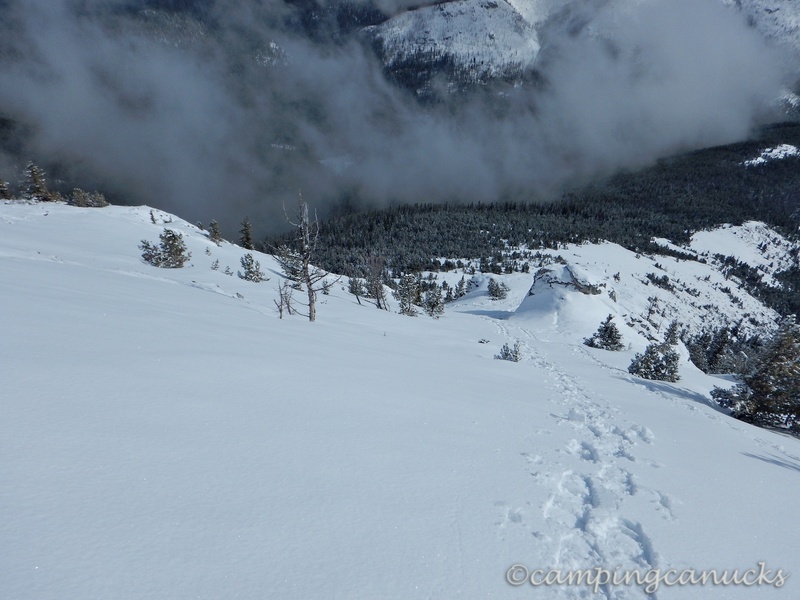 Once we cleared the chute, it started to open up into what is likely a steep talus slope when there is no snow. On this day, though, there were only a few inches of snow in most places and it was wind swept solid and provided very good footing. 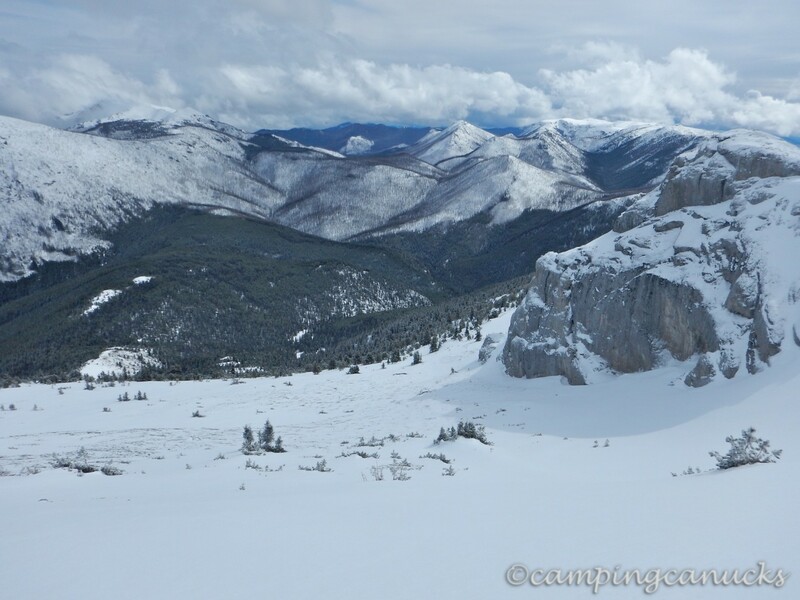 We relied heavily on the traction of our snowshoes and did wish at times we had crampons instead. 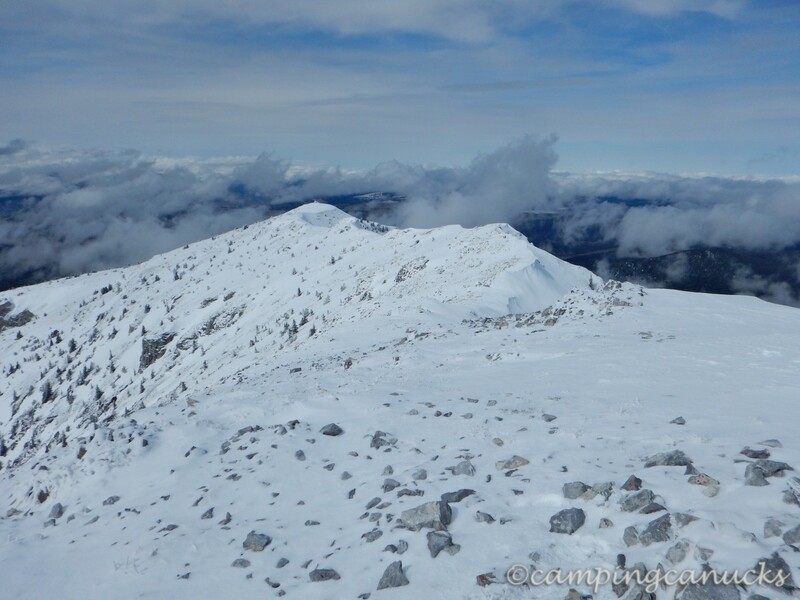 There looked to be a couple of different ways to get to the summit, so in our usual fashion, we took what looked to be an easier route but in the end turned out to be a bit dodgy. A slip would likely have meant a long slide down the mountain. But we did get some greats view of the north side of the peak. It was very windy as we approached but with the sun shining on us, it was not really all that cold. A good thing when one is standing fully exposed on the summit of a peak. We hung out for a few minutes, took some pictures, and decided to head down for a lunch break out of the wind. There was in fact a wind break built out of rocks at the top but on this day, it was largely buried in the snow. Getting down was interesting. The ground was a mix of wind swept and largely exposed rocks or deep drifts of blown-in snow and it was a steep drop down to the trees below. I could envision lots of snow and a great ski down. On this day, though, all I had were snowshoes so it was a slide down on the boots. After a quick slide down to the nearest drifts, I stomped a few times on the snow pack to see how solid it was before continuing on. Since it appeared to be quite stable and once again showed no signs of sliding over the winter, we headed on down, only to startle another group of ptarmigan sheltering in the trees below the peaks. These guys were a bit braver and I was able to get pretty close and get a good shot of one of them. Funnily enough, as I was slowly and carefully taking photos, Anthony pointed out to me that there was one a couple of feet away from me while I was sneaking up on its flock. But that one flew off when I tried to turn and take a photo. The way down was a bit tricky at times as we were more or less just sliding down. We did have to proceed carefully as there were plenty of times in which we sunk into the snow up to our waists. And we didn’t want to pitch forward or fall as there was a real risk of tumbling out of control. We were able to follow flagging tape at this point and descended by what is probably the most popular route. Once on the ridge, we made good time down until we ended up back in the trees above the trail back to the campsite. For some reason, we figured it would be easier to proceed in the brush without our snowshoes and spent much of the next hour post holing our way down. I’m not sure why I thought that would be easier…. After a somewhat exhausted slog through the forest, we exited the trail and made our way along the now very muddy road back to the truck after over eight hours on the trail. 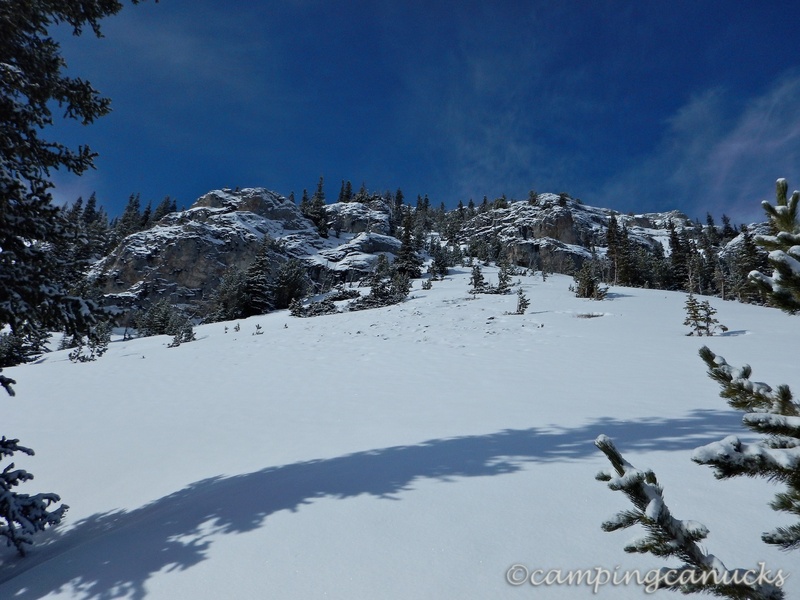 One thing about snowshoeing up a mountain, it is not a very fast trip. This was a pretty awesome trip for a late season snowshoe. Despite the risks, we took the time on many occasions to assess the conditions and determine whether we should proceed or not. In the end, we safely made it to the top and back again, and I don’t think either of us would hesitate to do this trip again. Although I would like to experience this peak in the summer with more time to explore the summit.